To support the Chapter’s diversity goals, the Affinity Group Program has been established. 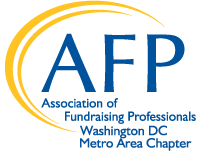 Affinity Groups provide AFP members and other fundraising professionals with additional opportunities to be with other individuals from a particular affinity group or geographical area who share similar job responsibilities, challenges, and perspectives. AFP members are encouraged to participate in any and all Affinity Group networking and educational gatherings as a way to enhance their membership. Non-members who participate in Affinity Groups will benefit from the opportunity to learn more about AFP and how it can be an important part of their career development. A bi-monthly brown bag lunch at rotating arts organizations around the DC metro area focusing on a chosen discussion topic. The group is led by Molly Goodman and Heather Koslov. Bi-monthly brown bag lunches in DC, alternating open discussions with speakers. Group leaders include Maureen Devine-Ahl (MK Fundraising Solutions) and Alicia Alexion (Alexion Fischer). This group fosters diversity and engagement among local DC area fundraising professionals of Black descent and African heritage. The Affinity group’s key objectives include: (1) provide professional development and mentorship, (2) maximize access to new and existing fundraising practices, and (3) increase visibility among Black and African-American fundraising professionals through communication, social media, and in-person events. Contact Jasmine Goodrich or Anna Barber for more information. A brown bag lunch every other month, hosted at rotating legal services organizations around the District. The discussion is focused on general trends in fundraising as well as issues that are specific to raising money from law firms and those interested in legal services. The group leader is Danny Reed (DC Bar Foundation). This affinity group is geared toward fundraisers aged 31 years old and younger. If you are 31 or under, you are automatically a member of the YPAG group, and we hope you will take full advantage! We aim to create engaging networking opportunities with educational events throughout the year for a rounded experience. The group is lead by Amanda Marcucci and Emma Shaw. This group provides networking and professional development opportunities for fundraisers and consultants who live or work in NOVA. Offerings include a monthly coffee club, brown bag lunches, happy hours and networking breakfasts - and are offered in the Arlington area and in western Fairfax/Loudoun/Prince William areas. Contact Shandra Niswander to get involved. For more information contact Julie Crudele and Allison Porter. This group meets every other month for networking and educational opportunities for LGBT fundraisers and allies. For more information contact Tommy Wrenn.